Our trip to Tokyo in early 2013 was all about patisseries and ramen. Well, it ain’t a pilgrimage for nothing. We flew budget to Tokyo and that meant transiting in Taipei. It was an overnight flight and after the gruelling experience of spending more than half a day airborne, we were visibly tired and hungry (read: grumpy). After a quick check in-to the apartment we would be putting up with over the next few days, we made a beeline for a late “lunch date” at 麺創房無敵家 Mutekiya, our first pitstop for ramen. Definitely wasted no time in getting into the pilgrimage mode! 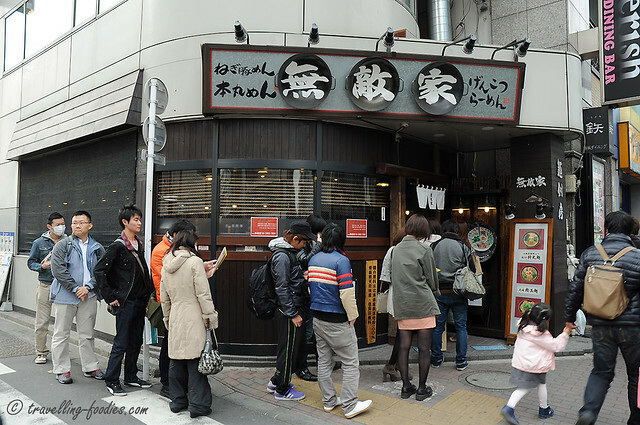 麺創房無敵家 Mutekiya is much raved for their ramen, specifically that of the “Kyushu style”. Located at the southern tip of the Ikebukuro JR station, it was conveniently just a stone-throw away from where we stayed. Literally just across the subway line. So coming here to get fed and fuelled made absolute perfect sense!